Although there are hundreds of wineries and vineyards in Sonoma and Napa, not all of them are open for weddings and some are a lot better for photography than others. One of my favorite wedding venues is the Kunde Family Estate. Kunde has two top wedding venues in wine country. Boot Hill over looking the vineyards below and the Dunfillan Ruins. The Dunfillan Ruins has got to be one of the top wedding locations in wine country for photography. This property is really photogenic and several Hollywood movies have been shot here, including Bottle Shock, a film about the rise of California wine making. Both of the wedding venues I just mentioned are featured in this film. The image above was taken on Boot Hill. Meritage resort in Napa is another wedding venue where I have photographed. This large resort close to San Francisco has an enormous wine cave that serves as a wedding ceremony site. Another world-class Napa Valley wedding venue worth mentioning is Auberg Du Soleil. I’ve photographed several weddings at the Calistoga luxury resort Solage, a sophisticated mountain getaway with the refreshing twist of having art, signature cruiser bikes and a bocce ball court. To see wedding photos taken here, view Solage wedding photos. 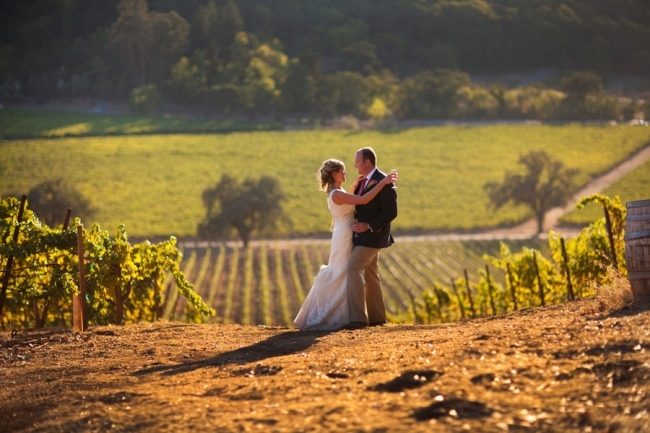 The more widely known Calistoga Ranch is another Calistoga hot spot for weddings. This luxury resort is in a private canyon and has one of the prettiest wine caves I have ever photographed. To see photos from here, view Calistoga Ranch wedding photos.